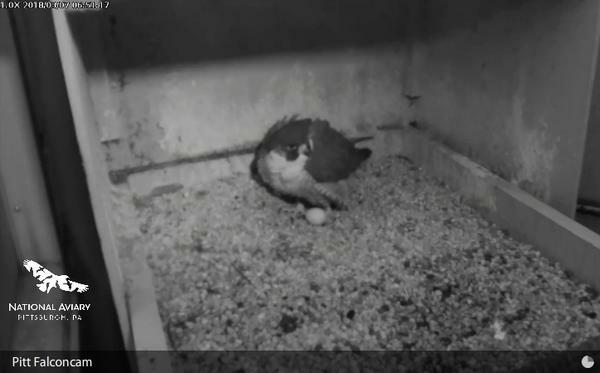 First Pitt Peregrine Egg of 2018! 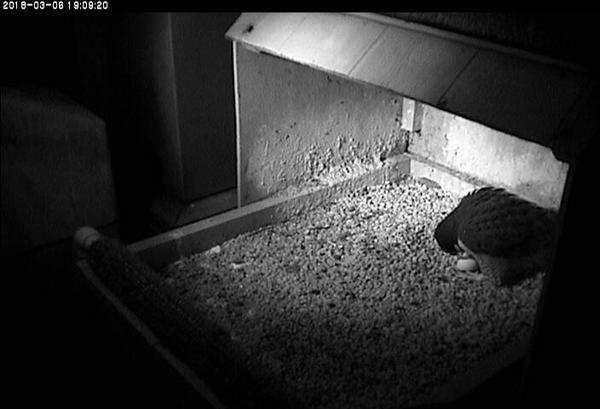 This evening, Hope, the female peregrine falcon at the University of Pittsburgh’s Cathedral of Learning, laid her first egg of 2018. This egg is earlier than I expected — I was guessing March 13 to 15 — but what do I know. Thank you to Sandy Montini for alerting me to this big event! Here’s another photo of Hope with her first egg. So peregrine nesting season has officially begun in Pittsburgh. Click here to watch the Pitt Peregrines on the National Aviary’s falconcam. UPDATED 7 MARCH, 7:05am. The captions tell the story. You might be wondering: Why isn’t Hope sitting on the egg all the time? 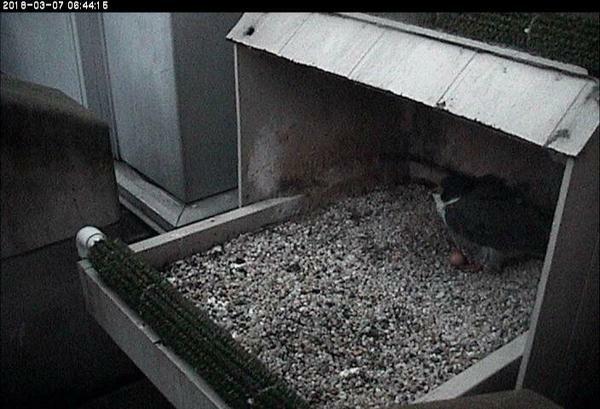 Unlike eagles, peregrines don’t incubate until the clutch is almost complete. Don’t worry when you see the egg like this. Click here for more information. Congratulations Kate!! what a surprise Hope !! Oh my goodness! Wonder how many there will be?! Thanks for letting us know, Kate. Kate,let’s pray Hope will not repeat the awful behavior she has done before. Was thinking the same thing. Please don’t eat the baby! I am so praying, Kate. Only time will tell us. THANKS for letting us know, I thought it would be later in March. Keep us posted. Hope things work out well for the new additions. Congrats! Iam so happy!! Let’s pray our Hope does not repeat the same behavior as the last two years. Thanks Kate for everything. Hoping Dori and Louie nest at gulf tower too. Wow, what an early surprise! Congratulations Hope and Terzo. I’m really looking forward to a drama free nesting season this year. Terzo came in just in a few minutes ago and the way he was looking at the egg he looked just as surprised as I was! Congrats Hope and Terzo. Pleasant surprise this morning. Made my day. Kate, I know you will be ready for a busy season. Thank you for all you share with us. Watched all last season, but got to see second egg emerge a little while ago. Way to go Mom!! Janet, no I haven’t but I haven’t been Downtown. Lori Maggio checks on them every day. She says that last spring they spent a lot of time at their other site but then nested at Gulf. So we won’t know until there’s an egg … or there’s not. I think I caught a glimpse of a second egg around 11:25 am on Friday. The way Hope was standing over it looked like she may have just finished laying it. Now it appears like she is incubating, but not sure if she is just protecting because of the cold.